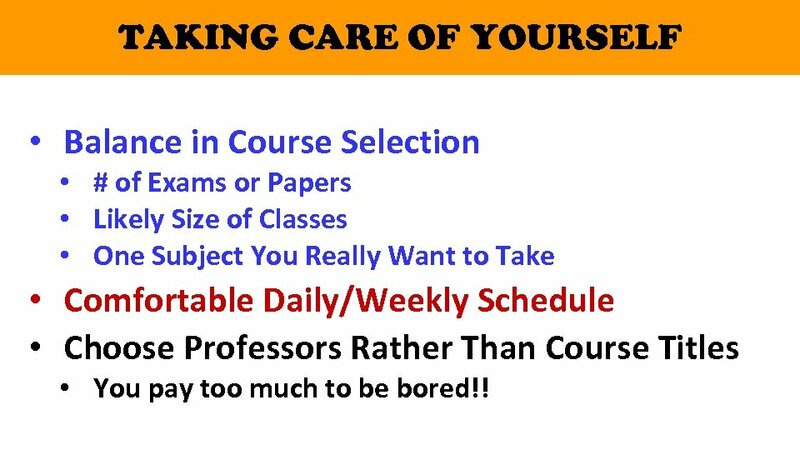 TAKING CARE OF YOURSELF • Balance in Course Selection • # of Exams or Papers • Likely Size of Classes • One Subject You Really Want to Take • Comfortable Daily/Weekly Schedule • Choose Professors Rather Than Course Titles • You pay too much to be bored!! 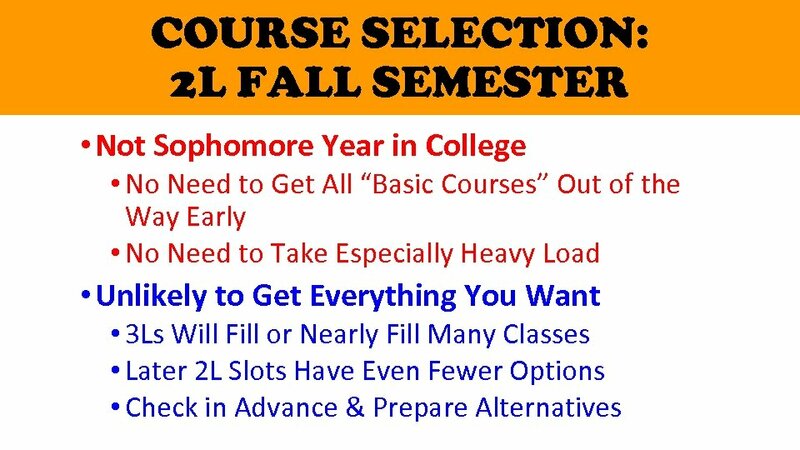 APPROACHING COURSE SELECTION [NON-TECHNICAL] QUESTIONS? 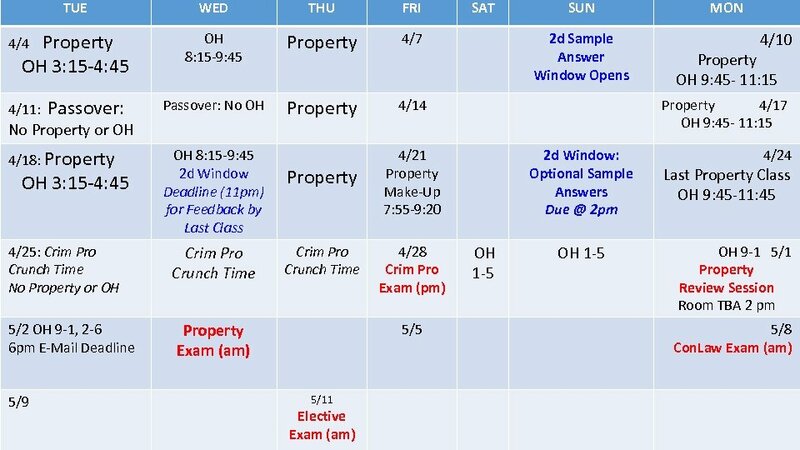 APRIL IS HERE! BRIEF IS IN!! WHAT NOW? ? 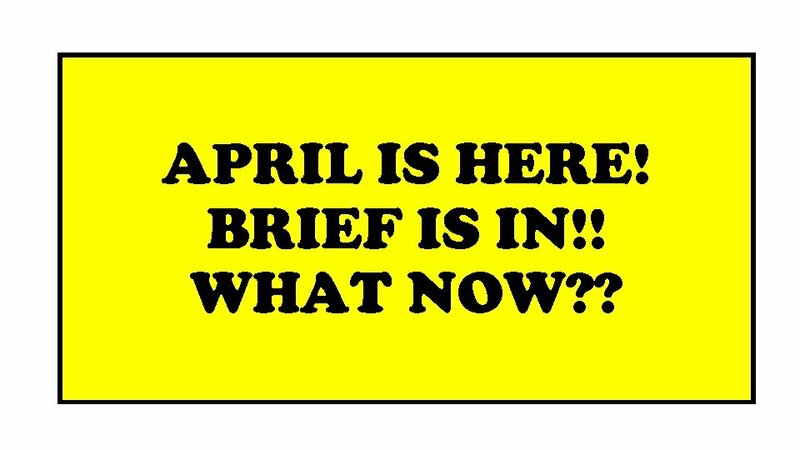 BRIEF IS IN! 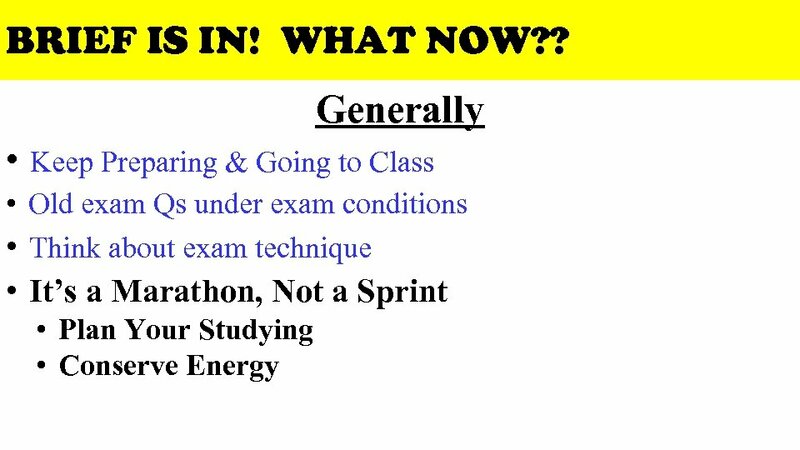 WHAT NOW? ? 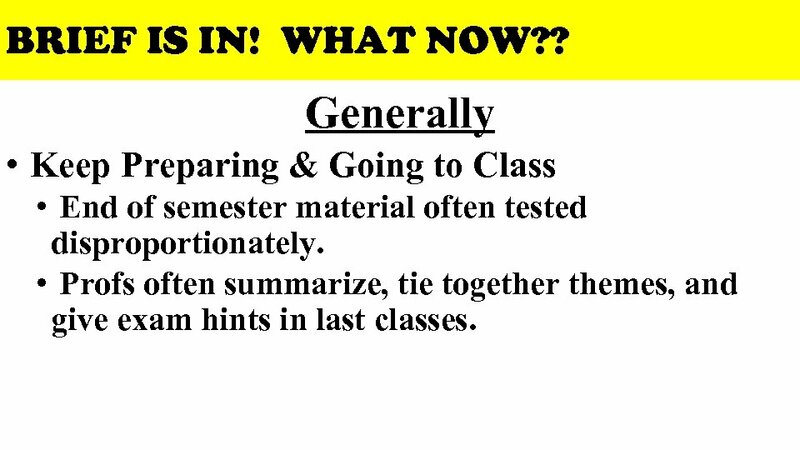 Generally • Keep Preparing & Going to Class • End of semester material often tested disproportionately. 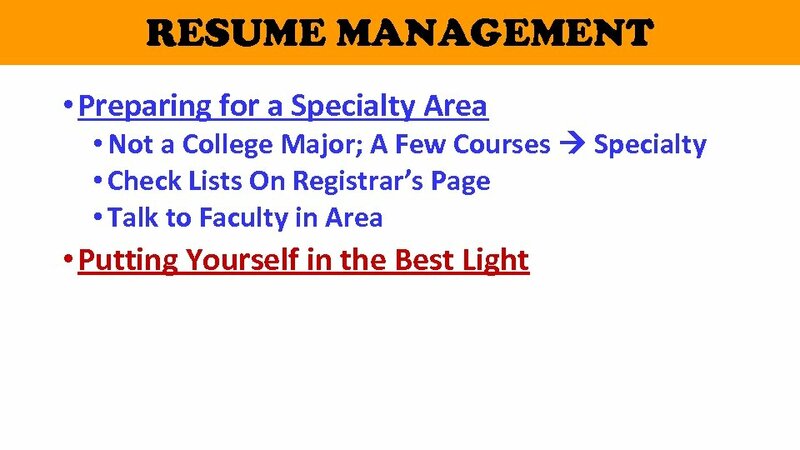 • Profs often summarize, tie together themes, and give exam hints in last classes. 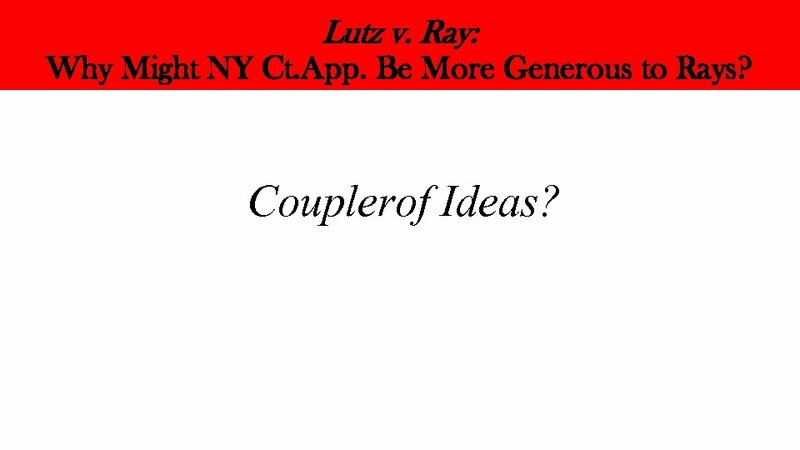 Lutz v. Ray: Why Might NY Ct. App. 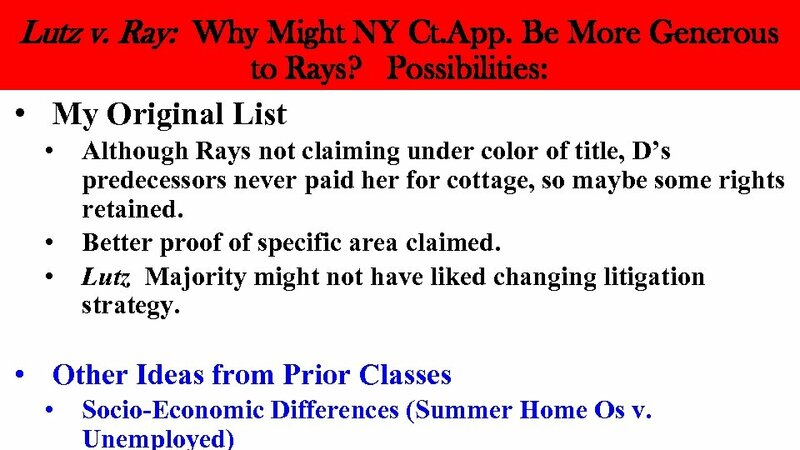 Be More Generous to Rays? Couplerof Ideas? 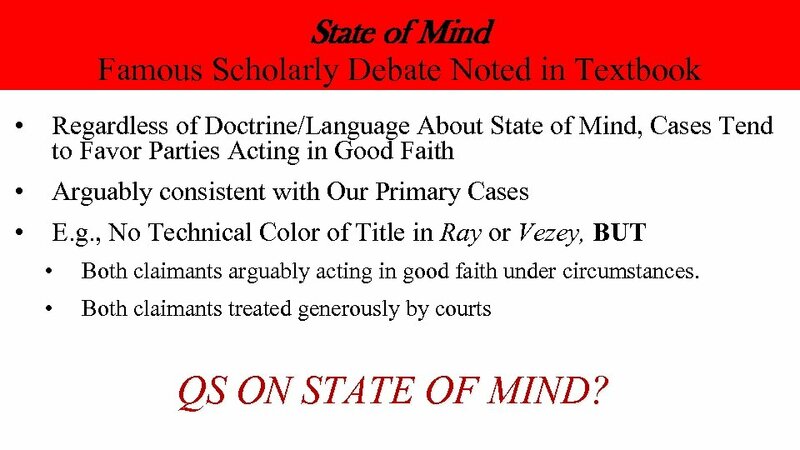 State of Mind Famous Scholarly Debate Noted in Textbook • Regardless of Doctrine/Language About State of Mind, Cases Tend to Favor Parties Acting in Good Faith • • Arguably consistent with Our Primary Cases E. g. , No Technical Color of Title in Ray or Vezey, BUT • Both claimants arguably acting in good faith under circumstances. 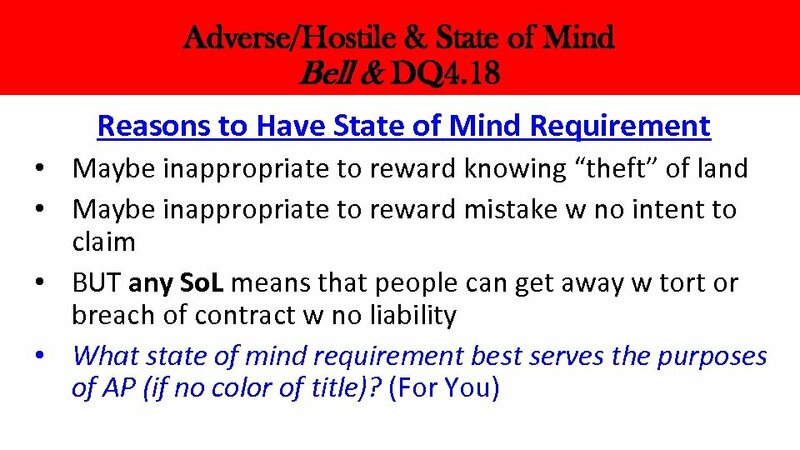 • Both claimants treated generously by courts QS ON STATE OF MIND? EVERGLADES: Rev. Prob. 4 E Last Names A-M (for OO = N) Last Names N-Z (for APor = D) • OO (Dolly) inherits lot w summer home & visits in 1990. 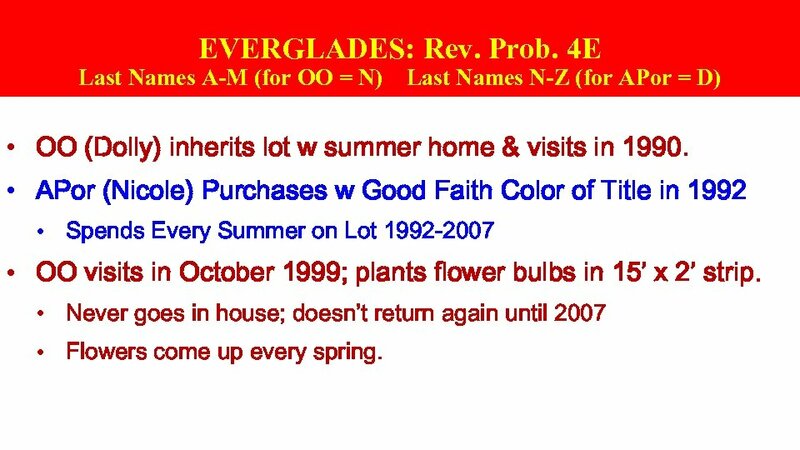 • APor (Nicole) Purchases w Good Faith Color of Title in 1992 • Spends Every Summer on Lot 1992 -2007 • OO visits in October 1999; plants flower bulbs in 15’ x 2’ strip. • Never goes in house; doesn’t return again until 2007 • Flowers come up every spring. EVERGLADES: Rev. Prob. 4 E Last Names A-M (for OO = N) Last Names N-Z (for APor = D) Arguments/Missing Info? 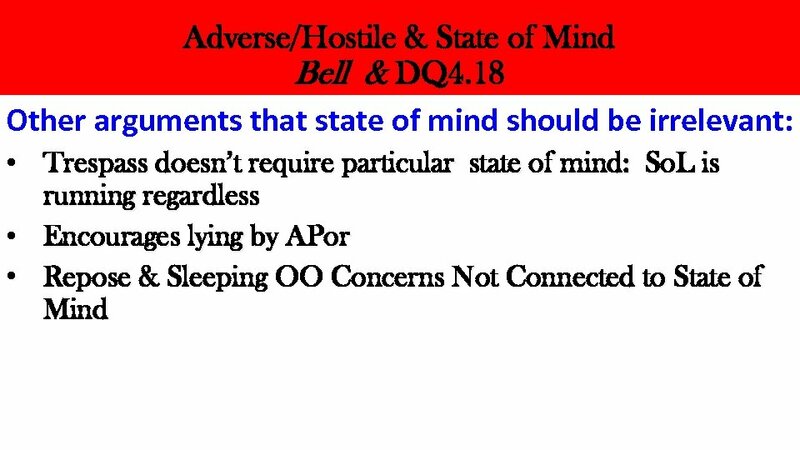 If jurisdiction accepts literal argument, OO wins. Assume it doesn’t. 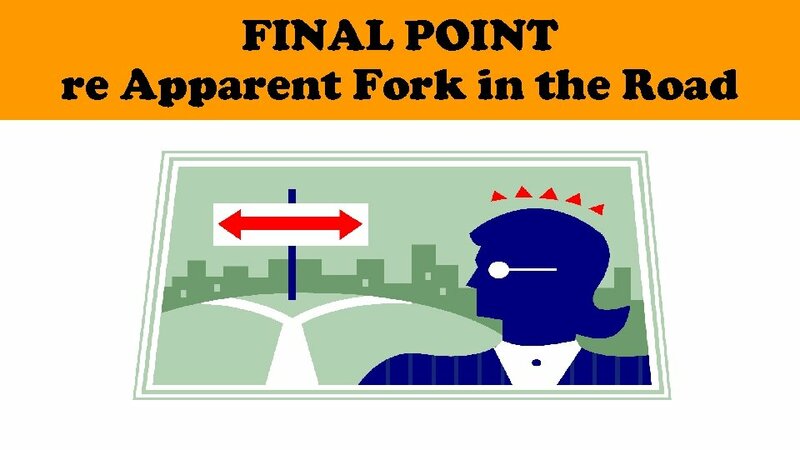 • Which facts in the problem (other than the passing of time) are helpful for each side? 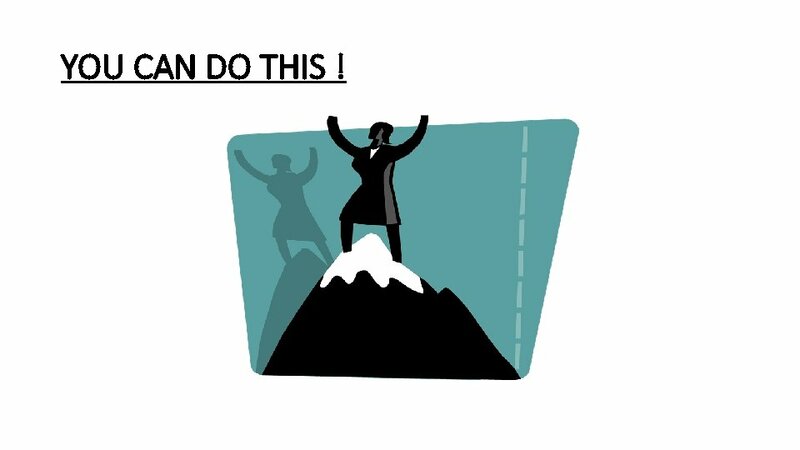 Be prepared to respond to other side’s claims. EVERGLADES: Rev. Prob. 4 E Last Names A-M (for OO = N) Last Names N-Z (for APor = D) Arguments/Missing Info? 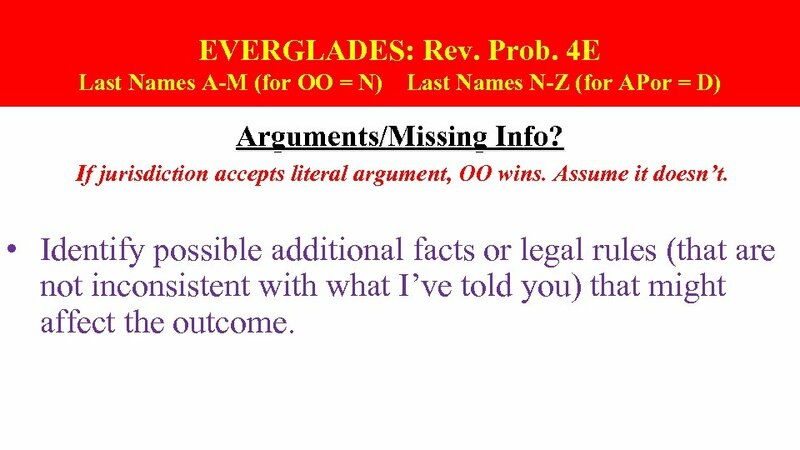 If jurisdiction accepts literal argument, OO wins. Assume it doesn’t. • Should a court consider what OO has done sufficient to defeat exclusivity in light of the policies implicated by this element? 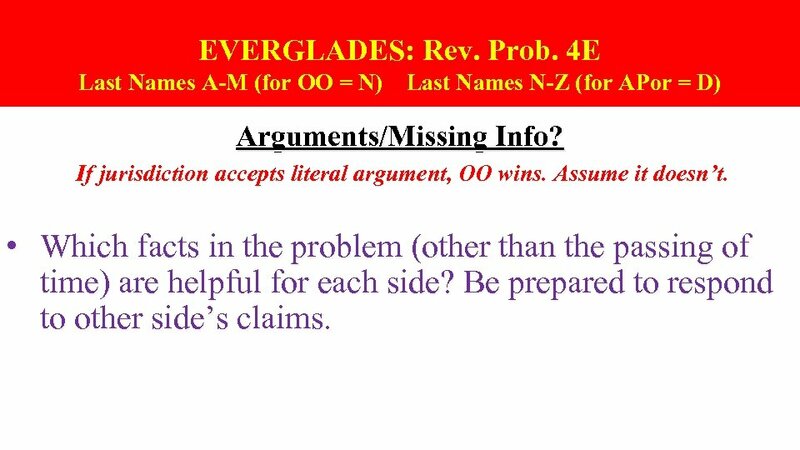 EVERGLADES: Rev. Prob. 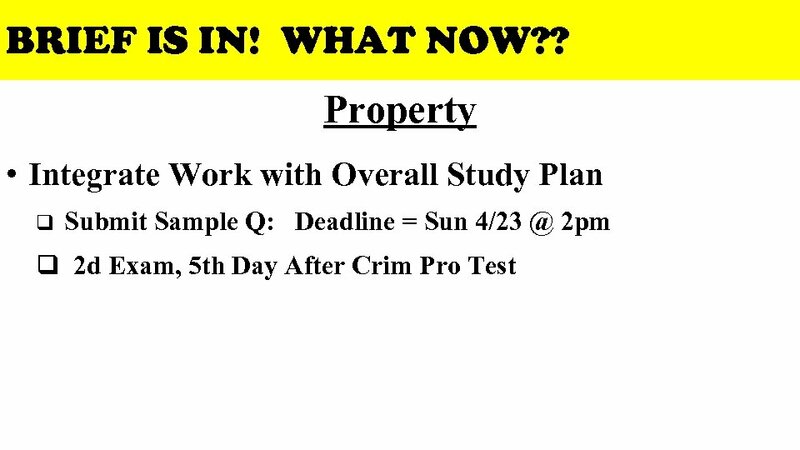 4 E Last Names A-M (for OO = N) Last Names N-Z (for APor = D) Arguments/Missing Info? 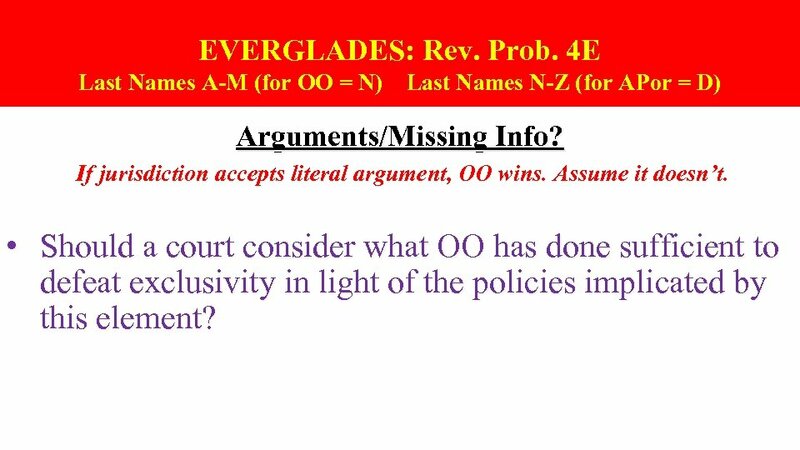 If jurisdiction accepts literal argument, OO wins. Assume it doesn’t. 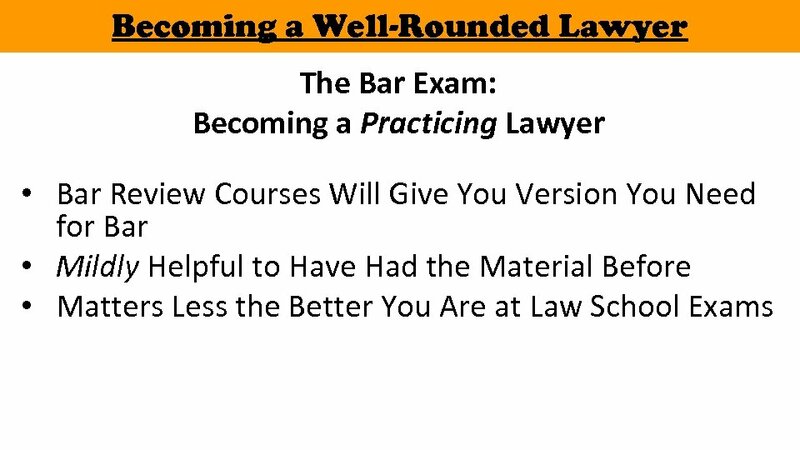 • Identify possible additional facts or legal rules (that are not inconsistent with what I’ve told you) that might affect the outcome. DQ 4. 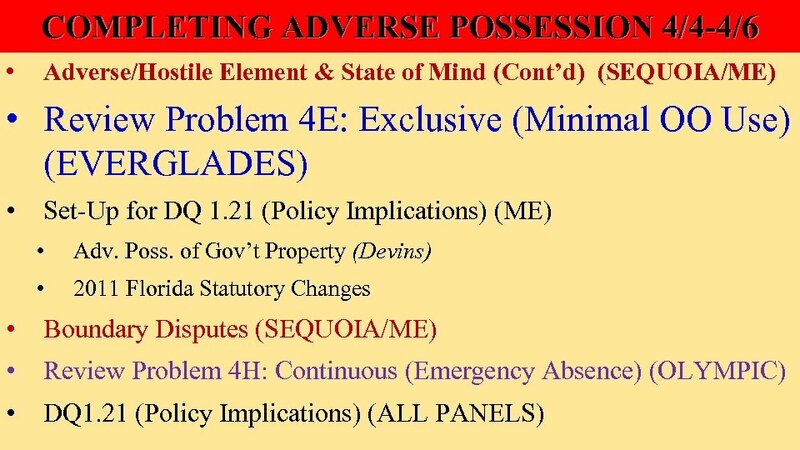 21: Adverse Possession Policy: Legislative Debate • State Legislature considering overhaul of Adv. Possession doctrine. 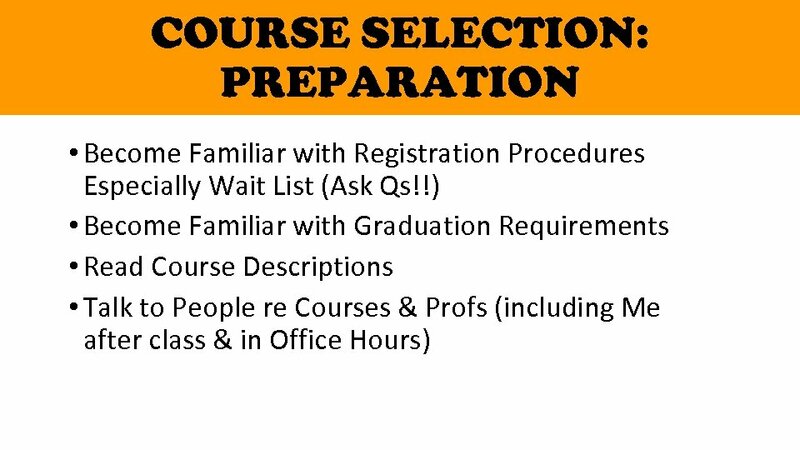 • You are legislative aides with each panel addressing specific Qs. 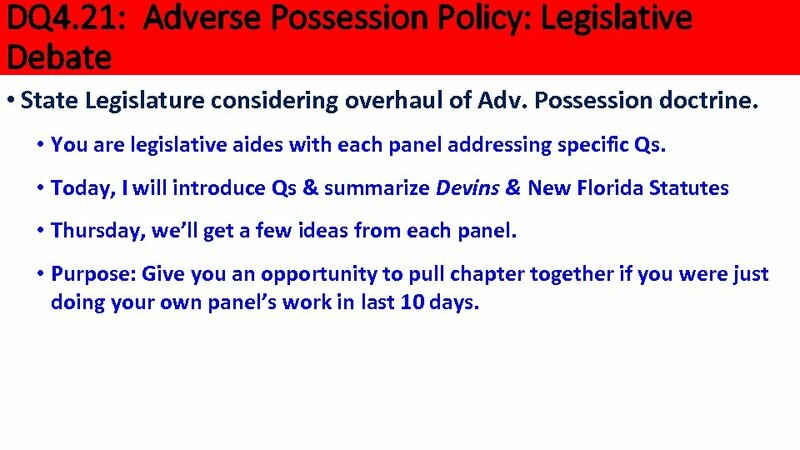 • Today, I will introduce Qs & summarize Devins & New Florida Statutes • Thursday, we’ll get a few ideas from each panel. 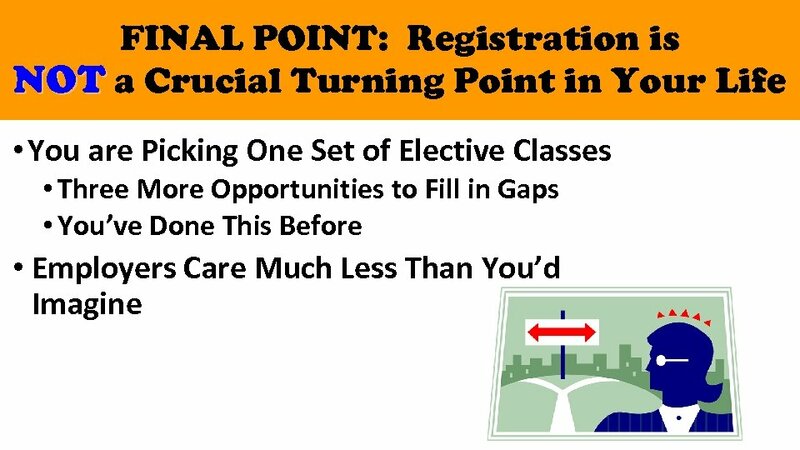 • Purpose: Give you an opportunity to pull chapter together if you were just doing your own panel’s work in last 10 days. DQ 4. 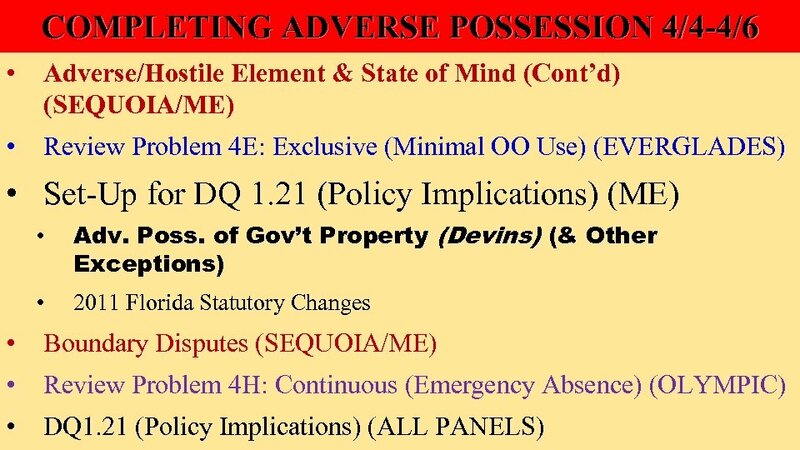 21: Adverse Possession Policy: Legislative Debate • State Legislature considering overhaul of Adv. Possession doctrine. 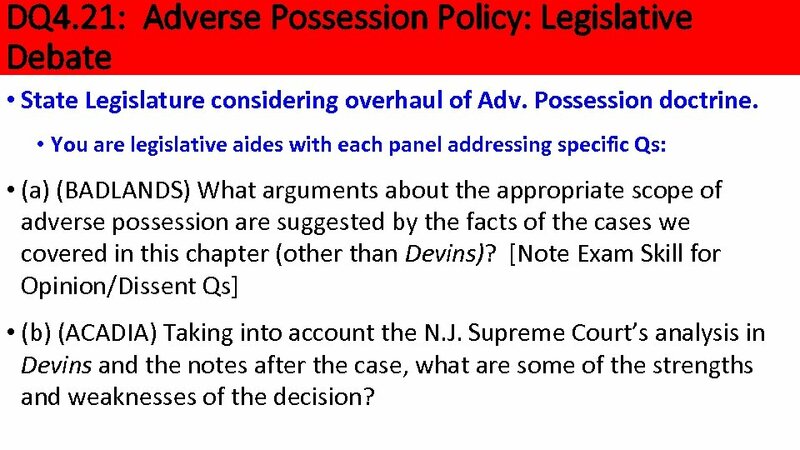 • You are legislative aides with each panel addressing specific Qs: • (a) (BADLANDS) What arguments about the appropriate scope of adverse possession are suggested by the facts of the cases we covered in this chapter (other than Devins)? 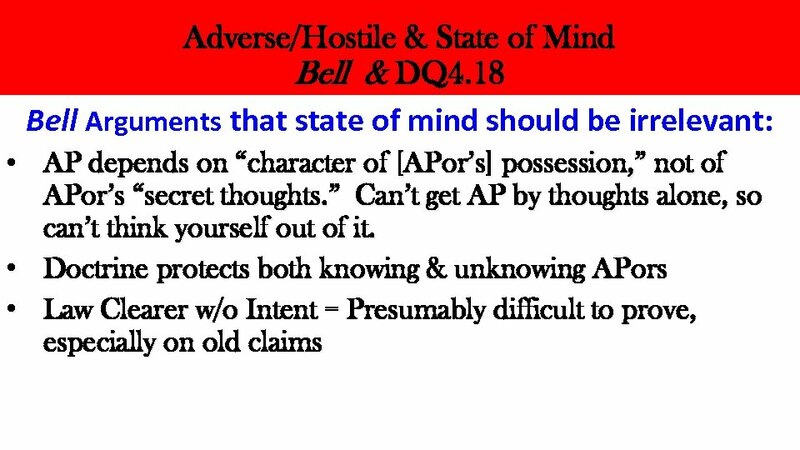 [Note Exam Skill for Opinion/Dissent Qs] • (b) (ACADIA) Taking into account the N. J. 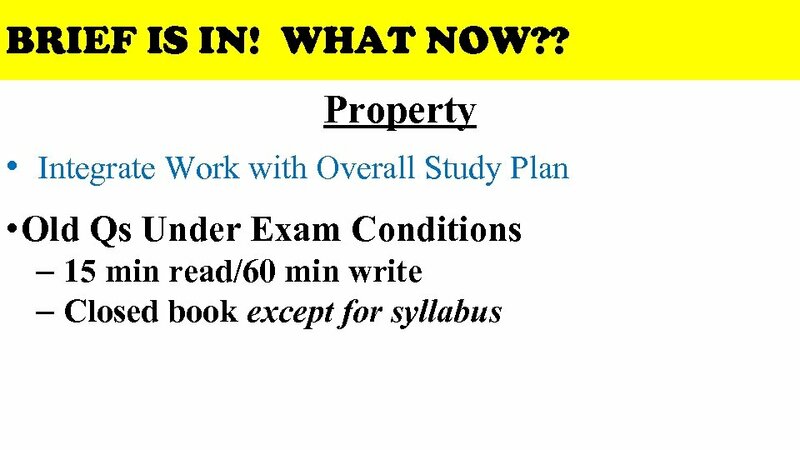 Supreme Court’s analysis in Devins and the notes after the case, what are some of the strengths and weaknesses of the decision? DQ 4. 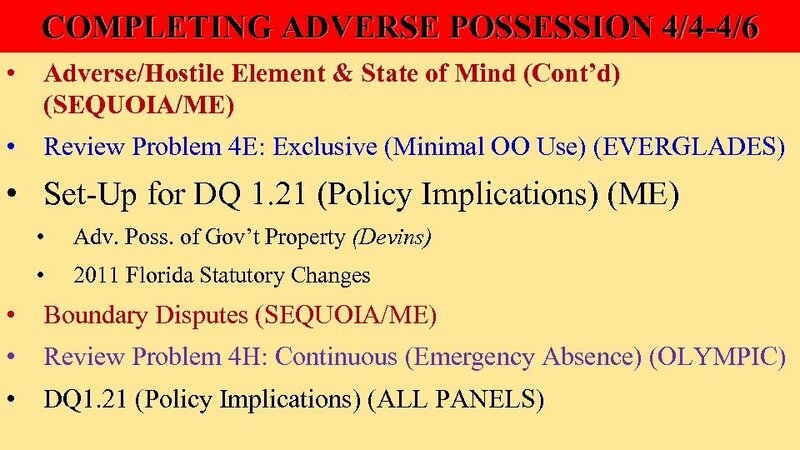 21: Adverse Possession Policy: Legislative Debate • State Legislature considering overhaul of Adv. Possession doctrine. 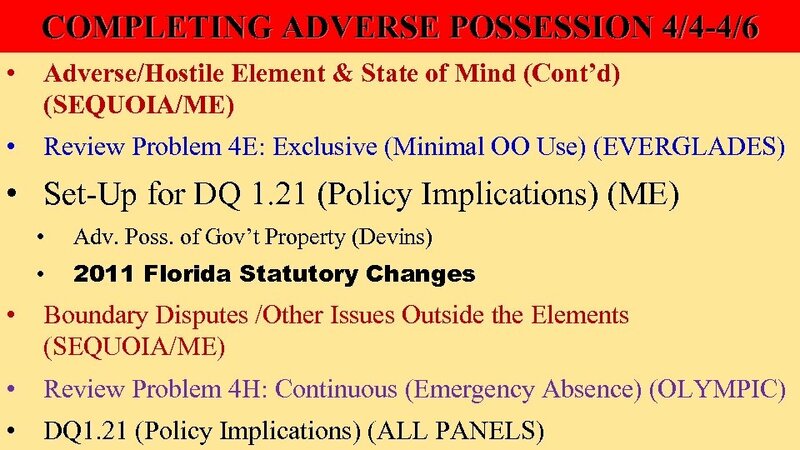 • You are legislative aides with each panel addressing specific Qs: • (c) (EVERGLADES) I will describe primary changes adopted by the Florida legislature in 2011. 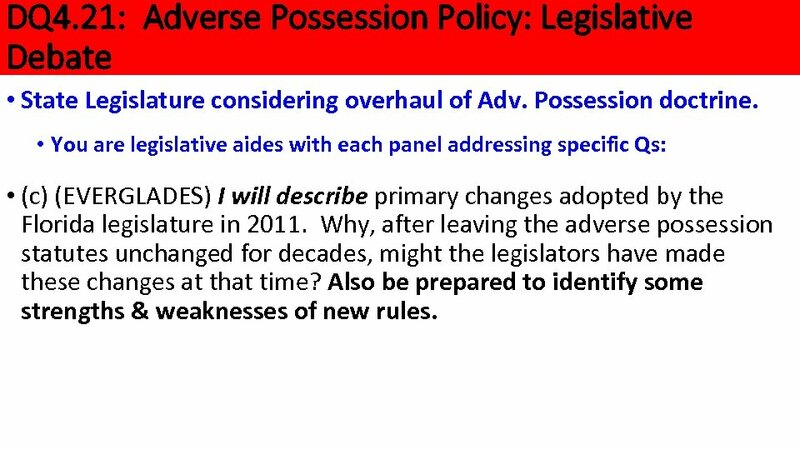 Why, after leaving the adverse possession statutes unchanged for decades, might the legislators have made these changes at that time? 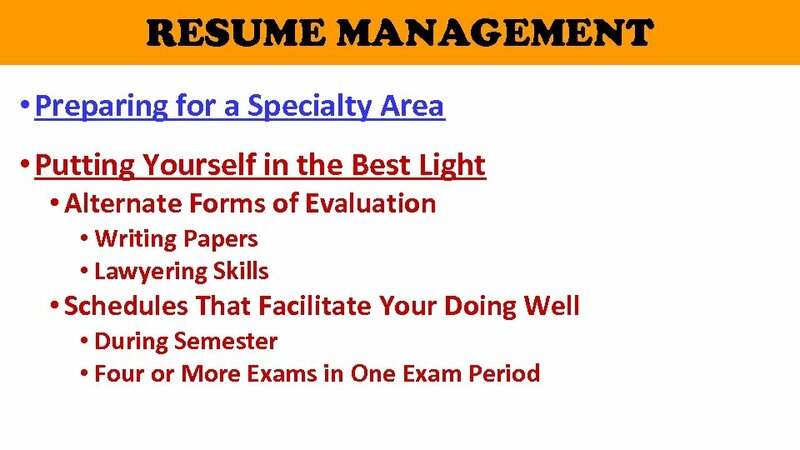 Also be prepared to identify some strengths & weaknesses of new rules. DQ 4. 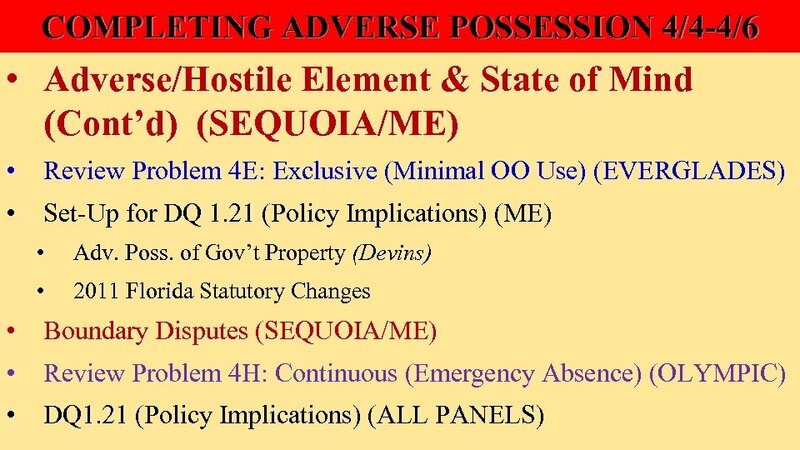 21: Adverse Possession Policy: Legislative Debate • State Legislature considering overhaul of Adv. Possession doctrine. 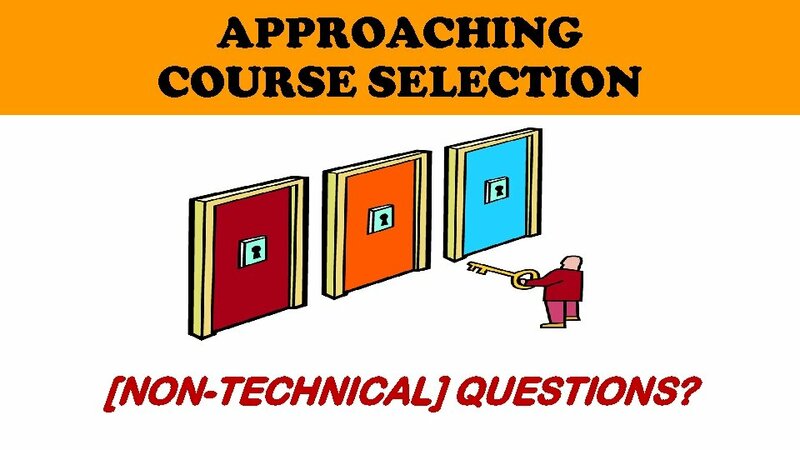 • You are legislative aides with each panel addressing specific Qs: • (d) (OLYMPIC) What positions might environmental advocacy groups take on adverse possession generally? On Devins? 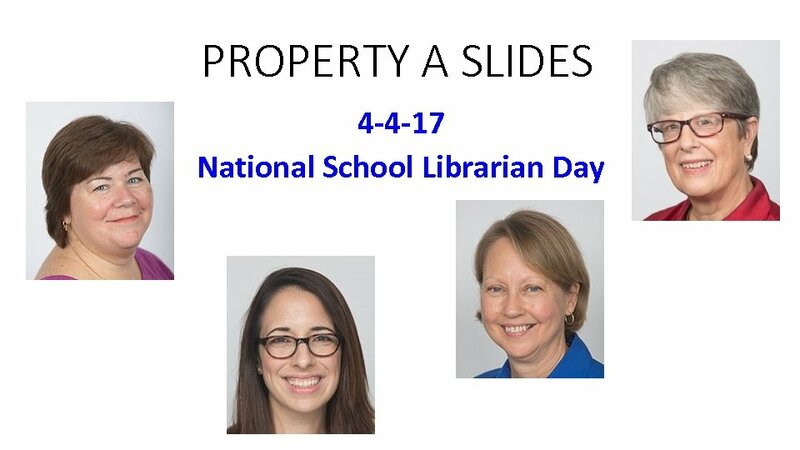 On the new Florida statutes? 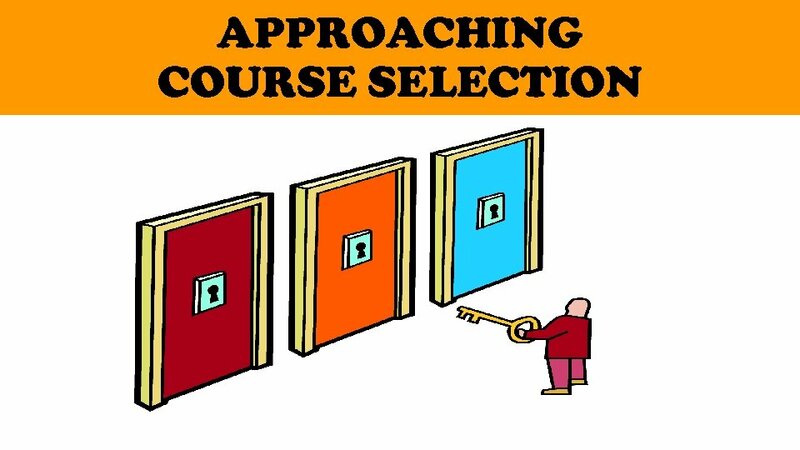 • (e) (SEQUOIA) What positions might groups representing the interests of homeless people take on adverse possession generally? On Devins? 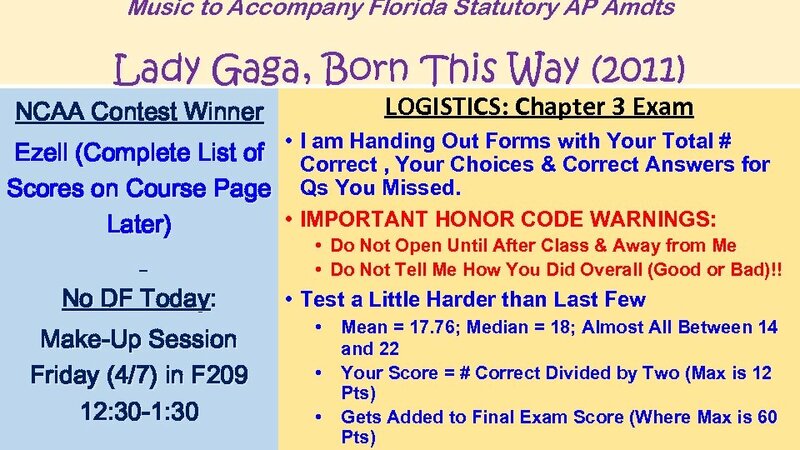 On the new Florida statutes? 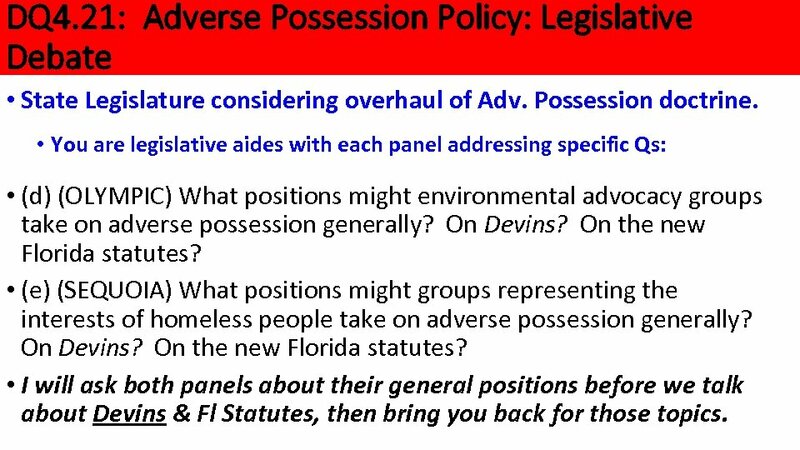 • I will ask both panels about their general positions before we talk about Devins & Fl Statutes, then bring you back for those topics. 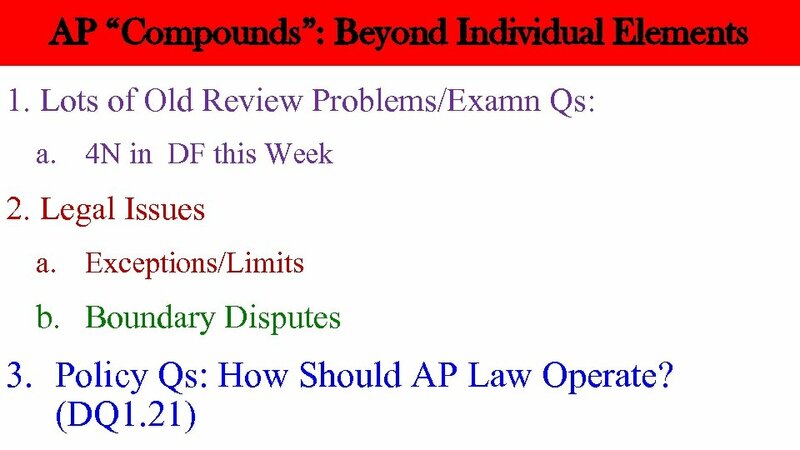 Some Exceptions/Limits to AP Based in Difficulty of Enforcement 1. 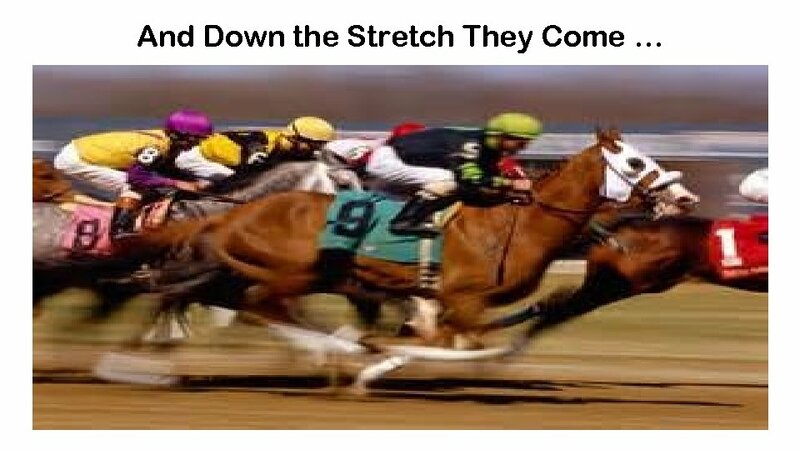 AP normally doesn’t run against future interest holder (e. g. , successful AP while legal owner has life estate just gets the life estate, not any remainder) 2. States have different provisions that toll the statute of limitations if listed “disability” exists at time AP begins. 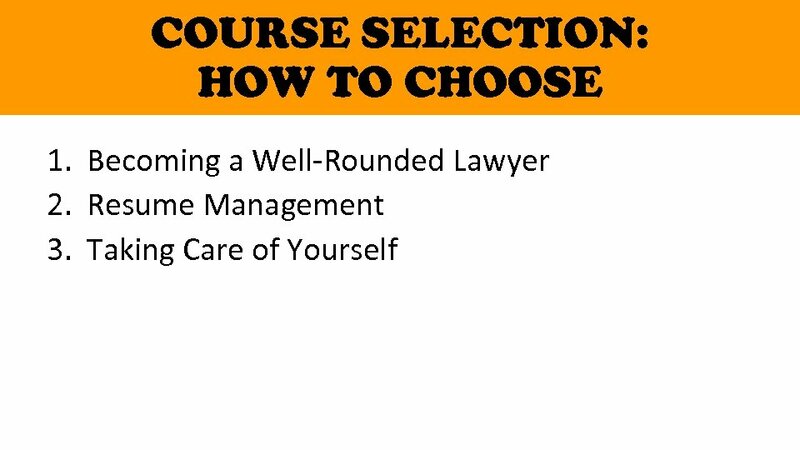 • • Helpful to have a general sense of the possible categories (e. g. , for Lawyering Q) Don’t need to know specifics of operation 3. 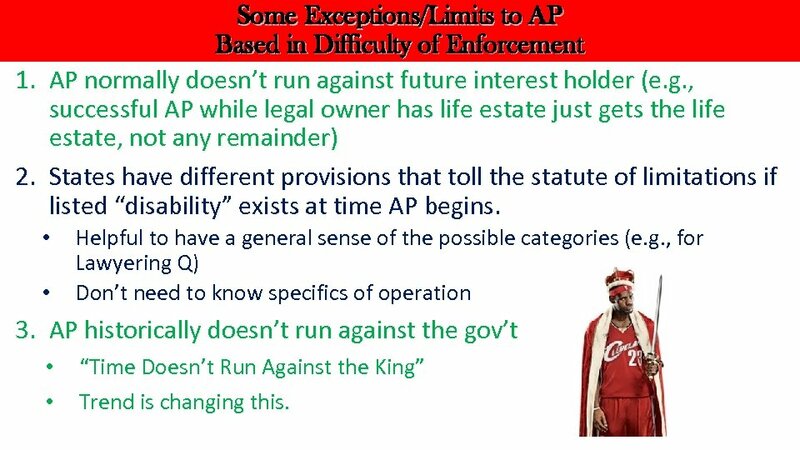 AP historically doesn’t run against the gov’t • • “Time Doesn’t Run Against the King” Trend is changing this. 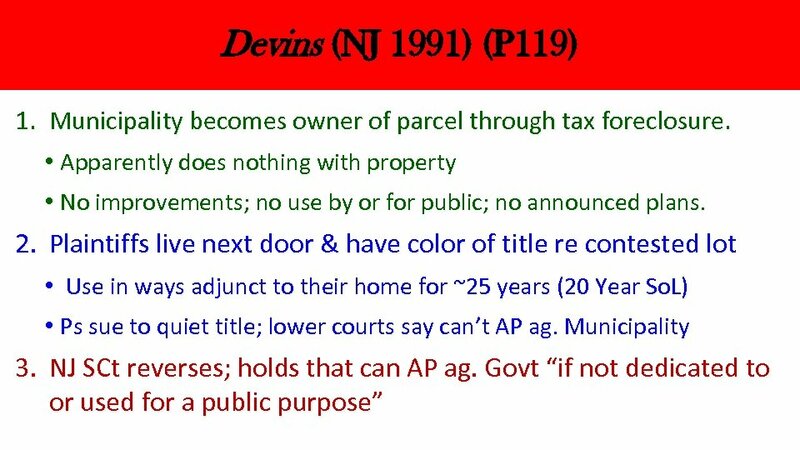 Devins (NJ 1991): Key Points 1. Purposes Behind Traditional Rule Protecting Gov’t • Gov’t “Too Busy” to Keep Track of All Land • State Holds Land in Trust for Public, who Shouldn’t Lose Land b/c Gov’t Personnel are Negligent • Shouldn’t Assume So. L Runs against State Unless Expressly Stated 2. 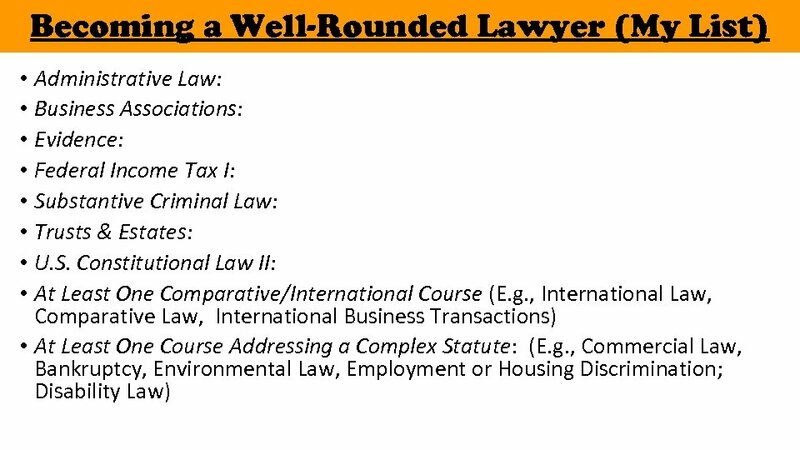 Legal Trend to Limit Traditional Rule (# of State Laws Listed) 3. 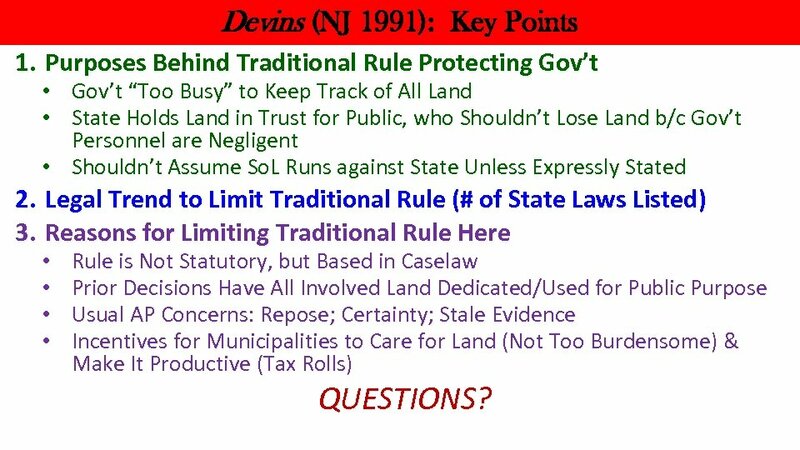 Reasons for Limiting Traditional Rule Here • • Rule is Not Statutory, but Based in Caselaw Prior Decisions Have All Involved Land Dedicated/Used for Public Purpose Usual AP Concerns: Repose; Certainty; Stale Evidence Incentives for Municipalities to Care for Land (Not Too Burdensome) & Make It Productive (Tax Rolls) QUESTIONS? 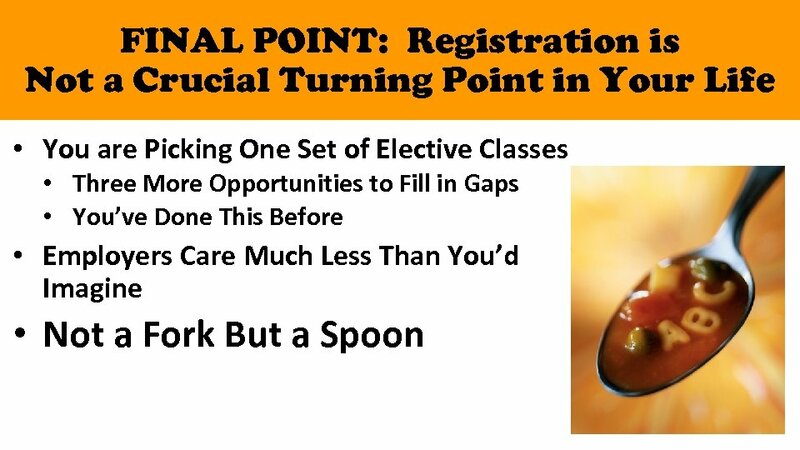 FL AP Amdts (2011) (S 117 -18): Key Points 1. Color of Title Provision (95. 16): Not Changed • Note re Ptachik point from last week re constructive possession of “known lot or single farm” 2. No Color of Title Provision (95. 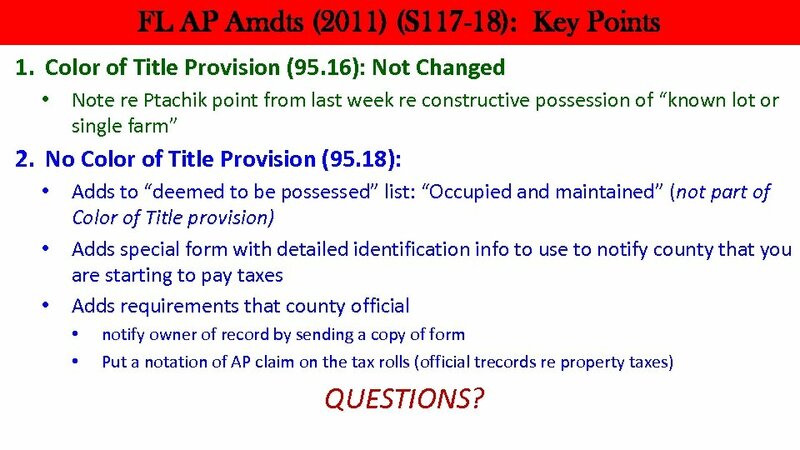 18): • Adds to “deemed to be possessed” list: “Occupied and maintained” (not part of Color of Title provision) • Adds special form with detailed identification info to use to notify county that you are starting to pay taxes • Adds requirements that county official • • notify owner of record by sending a copy of form Put a notation of AP claim on the tax rolls (official trecords re property taxes) QUESTIONS?